Vanuatu is a small island nation located in Oceania. In the 19th century, Great Britain and France both tried to seize power over the archipelago. As a result, Vauatu (then the New Hebrides) became a British-French Condominium in 1906. The struggle for independence began in the early 1970s, when Walter Lini established the New Hebrides National Party (since 1974, it has been known as the Vanua'aku Pati). 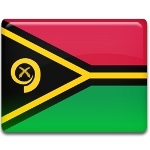 The date for full independence of Vanuatu was set in 1979. That same year, the drafting of the country's constitution began. The Constitutional Committee consisted of representatives of different political parties, religious leaders, and local tribal chiefs. The Constitution was signed on October 5, 1979. It came into force on July 30, 1980, when the New Hebrides gained independence as the Republic of Vanuatu. The anniversary of the signing was designated as a public holiday. Constitution Day in Vanuatu is marked with public speeches, official ceremonies and other festive events and activities.